Jared Taskin (Daniels) is an ex-cop, now bounty hunter. Due to a trauma in his past, he is currently in therapy, with a Dr. Weise (Bennett). When a serial killer known as “The Death Touch” starts rampaging around L.A., Taskin reconnects with some of his old cronies on the police force to help bring the baddie down. This includes former partner William Arkaday (Ducanon), and the two men, one representing the police, and the other representing the more “outside the law” angle, go in search of the notoriously hard to catch Death Toucher. Will they do it? 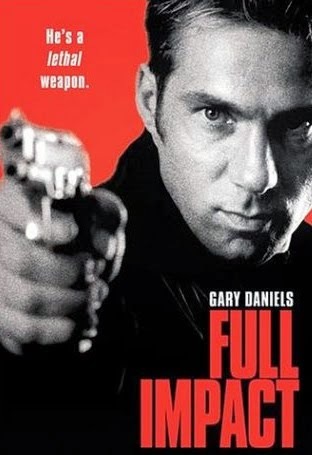 We really hope that this movie is someone’s first experience with Gary Daniels. While it’s pretty unrepresentative of the rest of his career, when you first put on Full Impact and see a montage of a luxuriantly-haired meathead flexing for the camera, it’s inevitable that the viewer will think one thing and one thing only: Awesome. 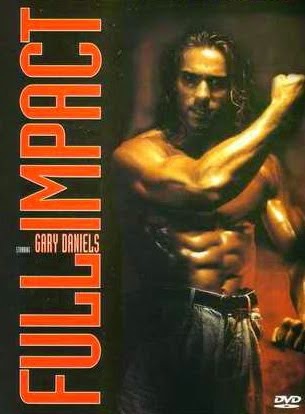 Before you watch Full Impact, you just have to brace yourself for rampant silliness. That’s all there is to it. Most of the movie is pretty funny, but it’s so brain-numbingly dumb, the brief 82 minute running time seems longer. Every few minutes, whether it makes sense or not, there is some sort of fight. That seems like it would be a good thing, but after a while the dumbness becomes fairly overwhelming. While the movie seems to have been shot in America, the dubbing is laughably atrocious. At least Daniels seems to have dubbed his own voice. The guy who dubbed his bald partner (the fact that Daniels, with his lovely blonde locks is teamed with a bald man has to be some kind of irony...doesn’t it?) either has a 30 cigar a day habit or is gargling with razor blades. Other characters on screen also make fun of Daniels’ hair. On top of that, he’s even called a “Limey Chuck Norris” at one point. Which is interesting, due to the parallels, plotwise, between this movie and A Force of One (1979). They should have called this movie “Taskin Force”. Maybe a third movie (after American Streetfighter - where Daniels and everyone else played different characters - though other elements remain the same, the two movies remain unconnected, despite what it may seem like) could be made where Jared Taskin is a member of the Taskin Force and he leads a gang of people to fight the baddies. Well, we can always dream. At least Taskin has a novel way of eating breakfast cereal. So it’s not a total loss. Gerald Okamura has a dialogue-less role as a Punchfighter in the one scene of Punchfighting in this movie. The scene is utterly pointless, but at least it features a shirtless Okamura grappling with his opponent. So it’s not a total loss. Ron Hall makes an appearance as one of Taskin’s opponents, and an American treasure named Sonny Lee plays Bruce Valentaine (no, we didn’t spell that wrong, that’s how the man chooses - yes, CHOOSES, to spell his name. We assume.) - a man unafraid to take on Taskin in the ring. It must be his American flag Zubaz that give him the confidence he needs. I certainly know that it works for me. Though aren’t there laws about desecrating the American flag? Ah, we kid Sonny/Bruce. We kid because we love. If only Full Impact was shot, written, edited, acted, choreographed, lit and dubbed better, it would be just...better. As it stands now, it’s a highly ridiculous moment in the career of Gary Daniels. Your tolerance for utter stupidity will determine how much you love or hate Full Impact. For us it was a mixed bag. Also check out write-ups from our buddies, Cool Target and DTVC! Sounds like gold to me! I'm in! This movie was shot pretty shabbily, as if done in a great hurry. Daniels was the only thing making it worthwhile. All of David Huey's movies have the same cheap look. Can't really remember much about this movie. I've got on DVD in a double bill with American Streetfighter. In fact I think my copy's called American Streetfighter 2: Full Impact (even though there's no connection between the two films). All I can really remember is Daniels sweet 90s ponytail. Someone really needs to ask him what happened to that. RobotGEEK: There's some silly Gary Daniels gold in this one. Roger: Agreed. Pretty junky overall...but at least Gary is decent in it. Jack: He needs to bring back the ponytail! Haha. It's not too late. As far as Daniels output does, this isn't one of his better films, if any film should be someone first experience with Daniels it's "Rage". Rage is solid. Same with Recoil.